Mohamed Salah once again defied ‘one-season wonder’ nonsense on Saturday as he reached 20 goals across all competitions for Liverpool this season. The forward scored the third of three unanswered goals against Bournemouth as the Reds reclaimed their three point lead over Manchester City at the top of the Premier League. 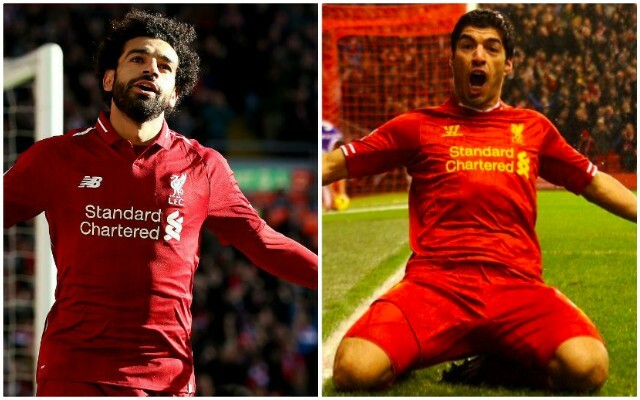 In doing so, the Egyptian became the first player to score at least 20 goals in successive seasons for the club since Luis Suarez. The Uruguayan scored 30 goals across the 2012/2013 campaign before improving on that tally with 31 as Liverpool finished runners-up in 2013/2014. Salah achieved the feat in style, finishing off an exceptional Liverpool team move that typified the hosts’ overall performance. The no.11 was in position to burst onto Roberto Firmino’s genius flick after the Brazilian’s run in-behind had been fed expertly by Naby Keita. With goalkeeper Artur Boruc approaching, Salah kept his composure to find the bottom corner with ease. He now boasts an incredible record of 64 goals in 86 appearances and remains on course to defend his 2017/2018 Golden Boot award.